← Fitness For Seniors – Take Back Your Health! If you glance through weightlifting magazines on occasion, you could be forgiven for thinking it takes all kinds of pills and potions, legal and otherwise, to build any true strength. But there’s good news if you’re trying to learn how to gain strength naturally… Progressive-resistance exercise, proper nutrition and plenty of rest are all that’s really required. In the freeweight area of any gym you’ll find 3 types of people: powerlifters training for strength, bodybuilders building for size and powerbuilders aiming for a combination of both. They may be doing the same exercises, especially the multi-joint compound exercises like squats and deadlifts, but each follows a different path in the gym. If your goal is to get stronger naturally, you’ll be emulating the powerlifters most closely. Your exercise program will be built mostly around compound exercises, but instead of just the deadlifts, squats and bench presses the powerlifters focus on you’ll also be adding exercises for your shoulders, triceps and biceps. The standing or seated overhead press, narrow-grip bench press and standing barbell curls are all common choices. Strength training involves lifting weights closer to your maximum ability, so longer rests between sets and exercises are necessary to let your strength, heart rate and breathing return closer to normal before starting the next set. Aim for a break of 1 – 2 minutes between warm-up sets and about 3 minutes between your heavy sets. For each exercise, start with one or two warmup sets with lighter loads to warm up the joints and muscles, then do your working sets. Five sets of five reps is common for those starting out in strength training, while more experienced lifters may go to 10 sets of 3 reps.
For a 5×5 workout, your working sets should be with a weight that allows you to do 5 reps on your first 3 sets, 3 or 4 on your fourth set and 2 to 3 on your fifth set. The weight stays the same for all 5 sets. If you can’t get 5 clean reps on the first 3 sets the weight is too heavy for you – dial it back a notch. At the opposite end, if you get all 5 reps done in all 5 sets, raise the weight A BIT starting at your next workout. Don’t go for huge jumps and risk hurting yourself – you can always go up again on the next workout if you get all 25 reps in again. For best results, aim to do 2 or 3 full-body workouts per week at first, on non-consecutive days. By your 2nd or 3rd year you’ll be lifting heavily enough you may want to do split routines, doing the whole body over 2 days, but by then you’ll know your body and it’s abilities well enough to make your own decision on that. And make no mistake – skipping workouts will hold back your progress more than just about any other reason. The most important thing to remember is to stick very strictly to proper form on every workout – injuries, especially severe injuries, are usually the result of not performing the exercise optimally. Don’t be tempted to cheat on your form for those last few reps to try and get there faster – an injury can set you back for months, years, or even permanently. Observe all standard safety precautions, and always train with a partner/spotter. 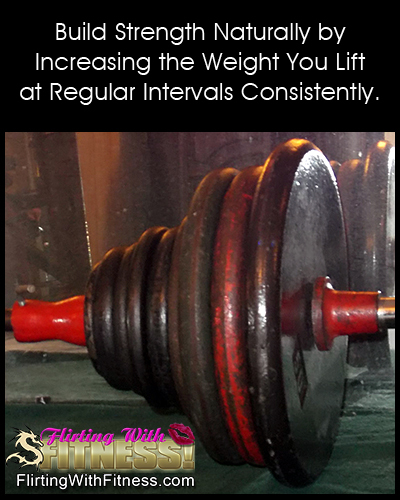 If you’re new to weightlifting you’ll probably be able to increase the weights you’re using regularly, but over time you’ll find the gains take longer and may even stop for a while. If and when you reach a plateau like that and you’ve had no increase in strength for a few months, take a week or ten days off to let your body heal fully and then start back at it with a drop of about 20% in the weights you lift. Don’t worry, you’ll gain that 20% back fairly quickly and most likely continue on right past that former sticking point. You’re asking your body to constantly face progressive resistance, lifting heavier than you ever have before as you gain strength naturally. For that to be possible you have to give your body what it needs – enough protein, carbohydrates and dietary fats. The amounts and ratio of them vary from person to person, so do prudent research into it or hire a registered nutritionist to help you set up your meal plan. For the purpose of this article, just realize that you’ll most likely need to eat more of each – protein so your muscles can strengthen and grow in strength, carbohydrates to power your workouts and daily activities and clean dietary fats to protect and lubricate your joints. Being deficient in any of the 3 can impede your progress, so learn to eat clean, eat well and eat enough! Most of the repairs are done by the night crew – in other words, while you’re asleep. For maximal recovery that means getting 7 to 9 hours of sleep a night every night. In today’s world it’s often almost impossible to do that every night, but aim to get that much sleep as many nights a week as you can. It CAN be done – skip a TV show, shut down on social media earlier, etc. And you most likely won’t have trouble getting to sleep at night – your body will be screaming for it! Avoid going to the gym on your scheduled rest days – in fact, try to avoid additional strenuous or taxing activities as much as possible – remember you’re in repair and recovery mode between workouts. Obviously most people can’t avoid it all, especially if your occupation requires it, but do the best you can if you’re seriously looking to get stronger. If you don’t know it already, one thing you’ll quickly learn from looking into how to build strength naturally is that for those who get the best results it’s a lifestyle, not a hobby. As with most good things in life, what you get in results will depend in large part on what you put into it. Is it easy? No. But you’ll find it’s definitely worth it! Self-Audit Your Workouts For Maximum Muscle And Strength Gains Build Muscle, Build Strength or Build Both? This entry was posted in Getting Stronger, Weightlifting and tagged gain strength naturally, getting stronger, how to gain strength, progressive resistance, strength training, workouts. Bookmark the permalink. Awesome post! I have free weights much like the ones in the photo and for the first few months of my training, made the mistake of not increasing the weight amount as I got stronger, I was only increasing reps. Once I started doing that and invested in a heavier set of weights, my results were amazing!